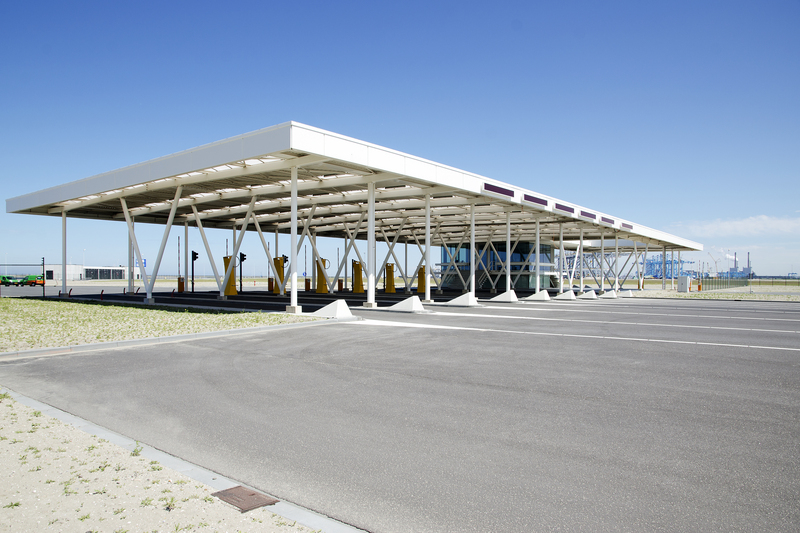 Camco’s in-house designed gate kiosks serve as self-service terminals where truck drivers perform identification and registration tasks while remaining seated in their truck cabin. All data is instantly checked with the TOS to optimize planning. This self-service concept significantly reduces operational costs and intervention times and increases overall throughput. The gate kiosk’s modular and rugged design makes installation, maintenance and component replacement easy, fast and convenient. It features a detachable component box and touch screen. The modular component box comprises a customizable set of kiosk modules, such as a two-way intercom with face camera, ticket printer, card reader, barcode reader and biometrics reader. Modules can be easily replaced by your own staff in a matter of minutes. Bull bars protect the component box and provide grip for truck drivers. Easily accessible touch screens with multi-language support provide a user-friendly interface for truck drivers. Simple and unambiguous instructions lead the truck driver through the transactions. If required, the driver can set up a call to the helpdesk using the VoIP intercom. Worldwide, 1.000+ kiosks are daily used by a large community of truck drivers. Designed specifically for harsh and aggressive environments. Various frame sizes, screen sizes and kiosk modules to accommodate specific terminal requirements. Frame and electronics are physically separated allowing easy installation or replacement in case of damage or defects. Various RFID reader support (HID, Mifare, GEN2, …). VoIP intercom with face camera. LED-based high bright LCD touch screens. Ticket printer for EIR and interchange routing. Extensive remote diagnostics and management software. 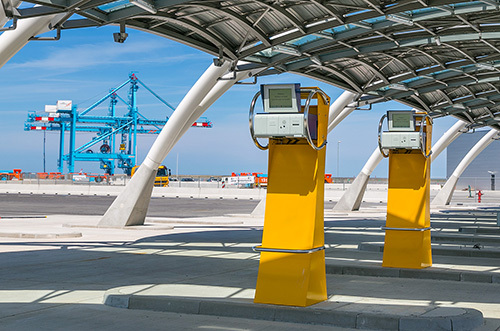 Together with Camco’s GOS software, gate kiosks allow terminal operators to optimize gate throughput while reducing operating costs and intervention times. Supports customization for terminal specific gate processes and needs. Plug and play kiosk modules allow swift on-site replacement by non-technical terminal staff in case of defect.